Yes, it’s like the apple bobbing down the river, ending up in the faster part of the flow. But for this to affect ocean heat content calculations – or, more specifically, changes in ocean heat content – you’d have to show how this tendency imparts a drift in the calculated value over time. If the bias is constant, it doesn’t impart a trend. If Y=mX + b is the correct model, and you always measure something that is Y=mX + b + e, you’ll still see the correct value of m.
In your estimation how often would a probe happen to rise into a “fast” current? It would seem more likely that most bouys would be restricted to slower currents which would suggest warmer conditions, at least in the lower latitudes. I have no idea how often an Argo probe gets drawn into a fast current. From looking at the Argo web site, the probes spend most of their time (about 9 days out of 10-11) at depth, but it’s quite possible that most of their horizontal movement is related to the shorter time at the surface. Sounds like the sort of conjecture that is best resolved by actually looking at the data, rather than speculating. The apples analogy is just an easy visual. …but back to the bias question – do you think that there is a change in the bias over time, and (if so) why? As to bias change, I would have to go with observable evidence. The percent of the surface area through 700 meters where we see rapid currents in the Atlantic are low compared to the doldrums in the center of the gyre and encumbrences/bottoming near the shores. For the bouys to be universally distributed rather then concentrated would seem to suggest they would not be subject to localized conditions. Yet, knowing the basic topography of the coastal plains I wonder at how devices in shallow waters would be able to report T/S at depth. This would appear to point to areas where there is greater depth and faster moving currents would be where we get a full profile and a high optical depth. Suggesting that at best they can represent changes in conditions upstream. At the slower edge/centers we can not get a full profile and likely are caught in slow moving currents, suggesting higher temperatures/salinity at the edges or at the center, the submerged buoys are shaded by natural surface flora and though we get a full profile it may not be represenative of “high optical depth”. As a random sample, if we limit the data set to the surface readings we should get the least amount of bias. It is when we rely on non-directed or a lack of spacial definition (X,Y,Z) of the sample set, and unknown optical conditions we lose sample integrity, IMHO. Very good point. If the Argo buoys do not degrade significantly over time and the distribution stays roughly similar, any bias should also repeat and as differences are what we are looking for in OHC – then these should be accurate. Bunching of buoys in currents might significantly change the distribution, and looking at Google Earth there are few buoys above and below 60 deg N,S – and vast areas of the Indian, South Atlantic and Southern Oceans un-monitored. The PDO was strongly negative during the period of 1946 to 1976, which is also the exact time period where global temperatures were stable. We also have experienced a more negative PDO since 2001 which also has coincided with a stable global temperature. I would suggest that if your deep ocean warming theory were correct it would have to be directly linked to the change in the PDO. The PDO’s negative cycle correlates too well with these multidecade temperature stabilizations for it to not be considered the probable primary driver. The mechanism by which it works may be heat sequestering or it may be changes in cloudiness, but whatever the mechanism, it’s the PDO. Unfortunately, if you admit that the PDO changes have that great of an effect on the climate you’re probably going to need to make some inconvenient alterations to the AGW beliefs and predictions. The temperature increase of the last 100 years could be more accurately described as linear rather than exponential as what we were seeing in the last 40 years wasn’t a drastic increase in temperatures but a normal multidecadal increase. Further, this would mean that models and predictions of future warming need to be revised as they do not include the notion of temperatures as cyclically increasing and then stabilizing over decades. To believe that the PDO is not a driver you must contend that there was some other cause for the static temperature trend that occurred between 1946 and 1976. Don’t tell me you really side with the IPCC, that a mysterious cloud of aerosols suddenly appeared, stuck around for 30 years and just as suddenly disappeared without leaving any evidence or having any discernable reason for existing. You might as well believe that pixie dust and fairies kept the planet cool. In order to defend the notion that the PDO isn’t the cause of that cooling trend you need to come up with a more likely scenario. The PDO is not just statistics, it’s a representation of the movement of currents within an ocean that covers 46% of the planet. Of course it could be a driver of temperature whether by sequestration of heat, changes in cloudiness or some other methodology. I find it hard to believe that there is any more likely suspect for the 1946-76 trend than the PDO. Let me get this straight. You folks can search for missing heat for no better reason than because you’re convinced it must be there regardless of the evidence. You can then prove the existence of this missing heat using little more evidence then a couple of computer programs. Yet you can’t be bothered to attempt to understand what actual evidence shows appears to be a very close correlation between rate of temperature change and the PDO. It doesn’t seem that you’re trying to understand the world, it seems you’re just attempting to defend a theory. So do you want the 50cent answer or the 5dollar…? Lets try 50 cent one to start with. Secondly, a portion of the old emitted aerosols (pre-1970s) can be seen on the surface of Arctic Ice. As to their reduction, the international efforts to remove visible soot and smoke from exhaust systems post 1969 has been very sucessful. Now rather then being emitted as visable pollution, the carbon has been more thourghly combusted and instead contributes to the growing CO2 in the atmosphere. As for missing heat, that is an on going investigation, though it is likely the indications science has uncovered so far are where the insolation/re-emission imbalance is most like to be harbored. We know they bought and burned the coal and oil. We have the invoices to prove it! Recently Counterpunch had an article which questioned the role of nuclear power to offeset carbon emissions. An interesting factoid within the article was that although electrical power was being generated (example of ~50GW per day for Japan), twice as much heat (100 GW per day) is being released into the oceans as “thermal discharge” from cooling systems. Although this appears as a significant amount on a daily basis (and only for one country), i’m wondering whether this is indeed significant and to what degree should such sources (indeed all heat sources) be also be considered as indirectly contributing to the warming of the planet. With the removal of significant nuclear capacity within Japan, would one expect to see changes in ocean surface temperatures? Silliness. Someone finding a smudge in Antartica does not prove that aerosols caused a temperature decrease between 46-76. Bear with me here and take a breath to think about what I’m saying before retorting by regurgitating climatology doctrine. Note the sudden directional changes that occur in 1946, 1976 and the early part of the last decade. These are not slow and gradual shifts, they are sudden alterations in directions. Note the second graph. This is what a change in aerosols would look like in the real world because aerosols would slowly increase and decrease as people’s behaviors changed from country to country and as aerosols dissapated from the atmosphere. The above temperature graph does not show the same gradual change. My second bit of evidence is that the aerosol levels would have to be massive to cause that large of a change in the temperature trend. The aerosols released by Mount Pinatubo, for example, were enough that it took 4 years for temperatures to return to the pre-eruption level. Using a completely inaccurate guesstimate it would take a mount Pinatubo eruption worth of aerosols being released 7 times to keep temperatures from increasing for the 30 year time period. Do you honestly believe that people started releasing that much aerosol suddenly, and just as suddenly stopped? Human behavior does not change that quickly. Now, take a second to realize that all that you folks understand regarding aerosol levels during this time period comes from theories. It has very little to do with actual evidence. We do, however, have actual evidence of a change in currents of the largest ocean on the planet that occurred simultaneous to the temperature shifts. But even though every meteorologist on the planet knows that currents effect the weather, for some reason climatologists believe it is impossible for them to effect climate. Here’s the deal, currents effect clouds and clouds effect forcings. You can tell me repeatedly that it is impossible for PDO to be a driver, but you’ll just be repeating something that is completely nonsensical. Of course it can. Now feel free to regurgitate climatological dogma. You haven’t taken Statistics 101. Basic statistics does change how you look at graphs like that. No dogma, not a matter of faith. Math. What’s pictured in that chart — and what isn’t — is not obvious from the picture: you need 20-30 years to define a climate trend. You’re arguing a notion you came up with on your own or found somewhere — fine, but use real information–you won’t convince anyone who understands the statistics by misreading a trend line as you’re doing above. This has been thought over for many years by many people. As to quick changes in temperatures, to put into perspective; A large, what a VE III, volcano in the Sub-Tropics emitted the equivalent of roughly 5km^3 of aerosols with a size of 10-25 times the diameter of smoke or soot. Between 1990 and 1993 human activity raised an equivalent amount globally. The reason you would not see the same effect is three fold, the height of release, the time period of the release, and the distribution. At a lower altitude the large diameter aerosol residence is generally days to weeks, the finer aerosols weeks to months. Generally by the time new emissions are registered the former have been washed out of the air. Rather then being a concentrated plume they are dispersed, (except for fixed power generation and social centers). So to recap to have a dramatic effect the emission would have to be borne to the tropopause heights and be emitted within a one month period, and from a centralized location to have a similar effect to Mt. Pinatubo. Does the lack of these basic processes mean aerosols are insignifcant, in no way. The evidence in the polar regions of an apparent increase high altitude super cooled water droplettes demonstrates that: One the level of wv reaching high into atmosphere, beyond the normal adiabatic wet/dry transition height is a major change in the atmosphere. Two, the lack of change in the average humidity in the upper troposphere and yet a high presence of water droplettes suggests that there has to be a process happening which allows water to condensate and yet not freeze. If you add in the layering of dark aerosols in polar ice floes, it is clear that aerosol concentration and size have changed over the last 60 years. Matter of fact, between 1972 and 2000 the global man made fossil fueled aerosol production dropped by nearly 80%. At the same time the population doubled and dirtier fuels and less efficient combustion for home heating, and mass transportation delivery systems increased with them. When we consider the tell tale effects of these changes along with increases in either “slash and burn” farming or forest fires related to extended dry periods that seem to be on the increase, along with a significant drop in both soil carbon and moisture, it becomes clear that aerosols are on the increase and can effect both percipitation and hence weather. However, as the aerosol residence time is short and seasonal the effects should be likewise, they are not. Yes, there is seasonality in aerosols as well as CO2; but, the forcing on the natural variation in the weather is much broader then the seasonality in the emission patterns. This points to one possibility, the variation in the natural pattern has to be driven by a process where the effect exceeds the residence life aerosols can have. Is it possible for Spring releases of aerosols to balance out the natural CO2 release from dying vegetation in the Fall, yes. It can be restated that there are natural cycles of ebb and flow in most cycles, whether it be aerosols or CO2. The point is when something pushes these cycles into either greater intensity or duration, the patterns of the weather will change. These changes will be manifest in ways we are only now discovering. We know of one way we are pushing natural variation, the Glory satellite with the APS microfine Lidar system would have helped define how much aerosols play into changes in the weather patterns. Sad to say that input to the equation will have to wait for a long time…. “Now feel free to regurgitate climatological dogma.” Poisoning the well now? Are you interested in advancing your/our understanding of nature, or only in defending your personal hypotheses? Your tone of writing, in any case, seems more suggestive of the latter, at least to me. Keep in mind that most aerosols (including sulfur-based ones) have very short lifetimes in the troposphere, on the order of several days, although they are longer in the stratosphere due to its reduced water content. The short lifetime and low altitude emission by humans (excepting aircraft) makes these emissions and their effects inherently much more local than e.g. CO2. Hence, the sulfur found in Greenland ice cores is more indicative of emission patterns from Canada and the US than of the global average aerosol concentrations, as is also explained in the Earth Observatory source you provide. It also means that, unlike CO2, even local aerosol emission reductions can show their effect very quickly, especially those done closer to Greenland and hence more likely to end up in its ice sheet. “Human behavior does not change that quickly” does not do much for me in explaining anything and, indeed, sounds rather like a dogmatic just-so story. Volcanic eruptions instead CAN propel their gases and small aerosols all the way into the stratosphere; the Pinatubo eruptions reached up to 24 km. Like this: http://hvo.wr.usgs.gov/volcanowatch/2007/images/Pinatubo_dust_layer.jpg. Up there they can have a much greater and longer-lasting effect, especially if released around the equator where the insolation is highest. Especially when you rationalize away the evidence that you are pointed to. . .
There’s 17,000 citations to choose from. And that’s just since 2006. If anyone can cite the numbers posted above for “a VE II volcano” and human aerosol output 1990-93, I’d appreciate help identifying sources. the request is _not_ for you. I understand you post vague recollections from a phenomenal memory. No worries, it’s your style, it gets by here. I like citations the way others collect stamps or beetles. It’s a hobby. I ask others for help, as I know others can find this stuff. As to aerosols the inclusion of dust/ash should also be considered as we are not only discussing albedo; but, are attempting to consider full spectrum optical depth, in addition to density of species/size of CCNs… The combination of which should change weather patterns. There were 2 papers that had addressed this, if I recall correctly. One was related to a aerosol modeling with the cooporation of NCAR and a Professor Thomas Choularton. The extent of which I believe touched on the Mt. Pinatubo event, (I think it was used as a modeling test case). The other I think was a review or AGU Poster of changes in LW/SW downwelling by a arm.gov supported NSF/DOE research team…, it may have been related to the UCAR COSMIC Lidar experimental series…? I believe there should also be a CCN study that should have support in a paper out of Washington State University about 2000, wrt the measurement of CCN/turbulance on droplet formation. The follow ups should have occured with a series of AGU CCN papers wrt saturated/super cooled cloud formations in the 2004 time frame. To also remedy my grevious error the VEI should have been a VI, I had suggested a III in error. (Though looking at a 2004 suggestion of between 3.8-4.3 km^3 of tempra would suggest a lower rating… I wonder if I made my mistake in est. based on trying to est. based on the I-II scale difference being based on log100 vs all other on the log10 scale. I’ll never know (or should it be, tell…)) Anyways thanks again. If you have an article that displays actual concrete evidence that total aerosols became extraordinarily high in the 1940s and dropped precipitously in 1976 please link it. The other links were stimulating but for the most part were very speculative or unrelated to the 1946-76 mystery cloud. Once again, we’re talking about a slow change in behavior, not the sudden transformation that is evidenced by the temperature data. I suppose if you believe that climate is only influenced by anthropogenic causes your mind will be forced to make all sorts of logical jumps to understand ‘unexpected’ variation in temperatures. Of course, if you considered the possibility that temperatures are influenced by other factors you might not have to sound like you’re insane when you explain the climate. Ok, let’s hypothetically consider the possibility that this mega cloud of aerosols existed. 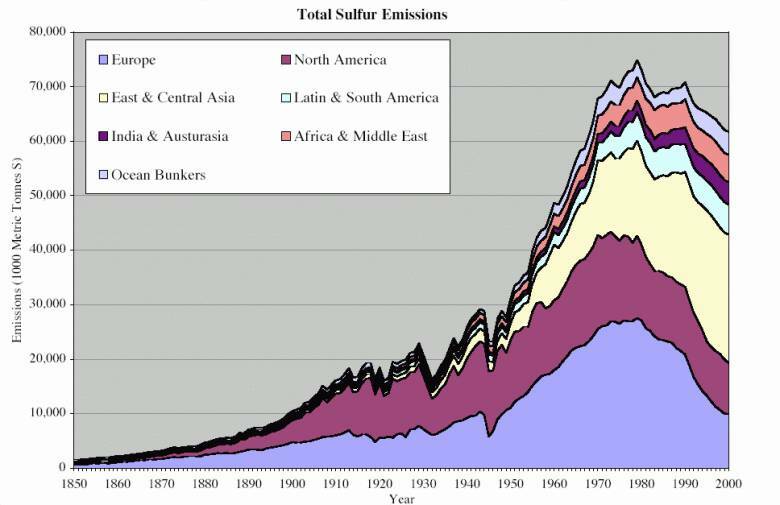 So, starting in 1970 state governments began mandating emission decreases. This began slowly, at first, in states like California and New York and then spread to the other states before adoption by the EPA. Next, the same restrictions were made more stringent over time. European states continued this behavior, although I’m sure communist countries merely flipped the bird at the suggestion of regulating emissions. Now, there’s another lag at each step in this transformation as individual corporations follow the regulations at their own pace and as equipment is replaced. So, I will conservatively say that this massive change in human behavior would take place over 10 years. Ok, Mr. Statistics 101, what is the probability that a change of temperature caused by aerosol reduction that took place over 10 years would, due to error and variability in data, actually appear to take place over a 1 year time period on gistemp? Pretty unlikely. Maybe it would be slower or faster, but it is extremely unlikely that it would be that much in error. Now, what is the probability that this same random occurrence of such an error would be repeated in all three temperature data sets? Mr Statistics 101? Would you guess it would be close to zero? Now, consider the fact that the opposite sudden change occurs in all data sets around 1946. I think it is a pretty safe conclusion to say that there was a sudden change in temperature as opposed to the long slow laborious process that would indicate aerosols. Well Sircharge, Jim Hansen would disagree with you because his latest paper suggests that Asian aerosols are a major cause of the stasis in temperatures and reduced warming imbalance to about 0.6W/M2 for the 2005-11 period. Dr Hansen also talks about a ‘delayed Pinitibo rebound effect’ which seems rather unlikely if not bizarre. Kevin Trenberth does not believe in the Asian aerosol cause of the stasis in temperatures and prefers to keep looking for the missing heat (about 0.3W/M2 equivalent) in the oceans. I must say that the IPCC charts on aerosol cooling with the wide error bars gives little confidence of the understanding of this effect. Here is a quote from the “Atmospheric Aerosol Properties & Climate Impacts Report” by the US governments Climate Change Science Program, 2009. That’s not what I did, as you can plainly see from the link, which was searching “aerosols+observations+climate.” The point was to show that there is indeed a plethora of observations of aerosol abundance, contrary to your (unsupported) assertion that there is “little actual evidence” regarding aerosols. Sorry that didn’t answer your concerns, but if you spent less time on sarcasm and more on attempting to write clearly, it might have been easier to tell what “evidence” you were actually inquiring after–from your comment at #274, it appears that you specifically want evidence of aerosol abundance from 1946-1976, which of course are mostly pre-satellite measurement. But you still give little reason to think that you really want that evidence–you haven’t cited anything from the literature. And the last three paragraphs of #274 are classic “hand-waving”–you discuss at length what “must” have happened with no apparent attempt to look at the work of those who may have studied it then or since. #274, #277–Well, since I’ve found that taking ideas seriously regardless of whether I think them particularly well-motivated or well-founded can be quite educative, I took an hour or two to look for answers to Sircharge’s question about papers on aerosol and climate. The hemispheric decline in optical transmissivity is well-supported and striking. A relatively more recent paper is Hegerl et al (1997), Multi-fingerprint detection and attribution analysis of greenhouse gas, greenhouse gas-plus-aerosol and solar forced climate change. The sulphate aerosol data were kindly made available by the Meteorological Institute of the Stockholm University and were calculated using the MOGUNTIA sulphur model (Langner and Rohde 1991) from historical SO2 emissions, based essentially on Mylona (1993) and Gschwandtner et al. (1986), and from projected future emissions from the IPCC 1992 scenario A (Pepper et al. 1992). The scenario forcing fields are similar to those shown in Mitchell et al. (1995a, b), except that the pattern of the aerosol forcing was not spatially fixed before 1990, but was allowed to respond to the spatially changing patterns of sulfur emissions (see Mitchell and Johns 1997). The forcing fields are shown in Cubasch et al. (1996). The impact of the computed aerosol concentrations was represented in the CGCM as an increased effective surface albedo. The global mean of the radiative forcing at the top of the atmosphere due to the aerosols is approximately !0.7 W/m2 in 1980. Indirect effects of aerosols on the formation and radiative properties of clouds were not considered. These are generally estimated to be of comparable magnitude to the direct effects, and may produce different climate change patterns (Jones et al. 1994; Boucher and Lohmann 1995). Our computations of the aerosol climate impact must therefore be regarded as only qualitative. Would someone who has a subscription and can read the full article let us know what’s in this one? Hank @ 280 – See comment @ 71 by one of the co-authors Geert Jan van Oldenborgh. Thanks JCH and Rob and my apology to Geert, who as Rob points out had in this thread mentioned an upcoming correction to a minor calculation error, along with providing the link for the full text of the paper as published.